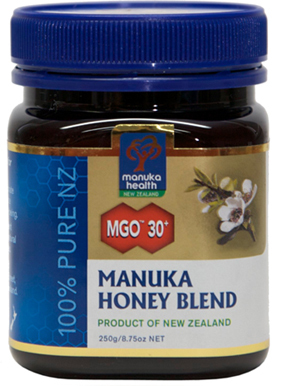 Unique to New Zealand MGO™ Manuka honey is the only 100% natural food in the world shown to have EFFECTIVE and RELIABLE anti-bacterial activity due to the active compound – Dietary Methylglyoxal which forms naturally in the nectar of manuka plant. Manuka Honey is collected from a plant that is unique to New Zealand - Leptospermum scoparium. 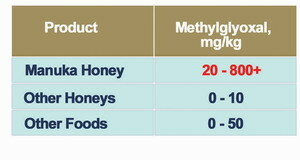 So far MGO™ Manuka honey has been the only food in the world found with such a significant Dietary Methylglyoxal content ranging from 20mg/kg to over 800mg/kg. In contrast all other honeys worldwide tested have ranged between 1 to 10 mg/kg, other foods range from 0 to 50mg/kg with coffee and cocoa being the highest.